[5-2-2015]_ Quadrill v1.1.2 contains bugfixes on game start for certain system configurations that throw errors while changing music volume. It can be downloaded from the main page (or here). [10-22-2013]_ Quadrill v1.1.1 is available for download on the main page via Quadrill v1.1.1 (VB.NET 2003). This new version now features music, area names now pop op when you change the map, and added four blocks to Cereal Forest to prevent players from getting stuck on rising gates. [6-2-2013]_ Quadrill v1.1 is available for download on the main page (or here). It's only 1.42 MB as it is a very simple game. I have added save file support: there are four slots available for game saves. I have also added the ability to rebind keys (I had an hour of spare time so I just chucked it in there). Enough chat, have a download of Quadrill v1.1 and give me your feedback. [4-20-2013]_ I've completed all of the maps from the original Quadrill. They all work (to some extent) the way they did in the original Quadrill. Now, the original Quadrill did not have save points - it was a game that you had to play from start to finish (granted that you could complete it in under an hour) and you had no continues - that meant that any death would close the application and you had to start from the beginning all over again. I'm not going to force my players to do that (it's probably why I never uploaded the complete version of Quadrill to the best of my knowledge). That's why I'm going to add game save support to this remake - so that you all won't have to start from the beginning after a simple mistake 30 minutes into the game. The other thing that I'm going to add to the Quadrill remake is a bunch of new tilesets (currently, I have space for 16) - in the Quadrill Demo (that was released on Extreme Visual Basic Forum), Cereal Forest and Jungilitis were two areas with different tilesets, even though the only difference between those tilesets were bushes instead of trees. I've combined those tilesets into one and modified a few others to support more diverse tilesets. 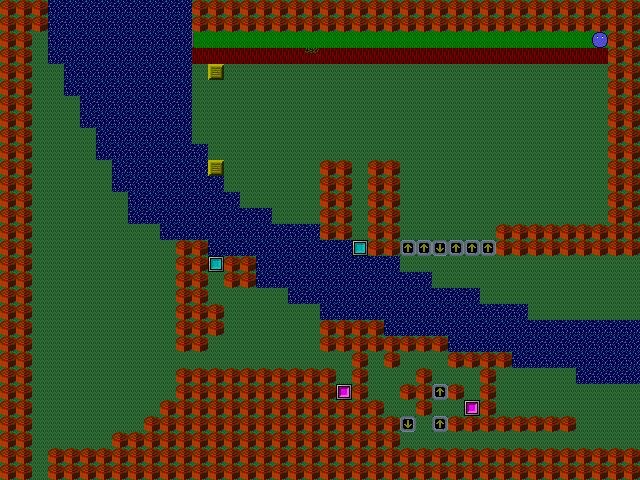 As a result, you get the minimalist tileset that you see over to the right. That, and there's no tileset for the Conclusion Tunnel in the existing tilesets, so I had to make a new one. I've added a fog that helps to distinguish from the current map and maps that lie beneath. I'll owe you all a picture of Sauraqia cave again (just like I do everytime I put it in Quadrill). [4-16-2013]_ This is the treetop walkway from Cereal Forest. In the original, climbing the stairs led to the room with wooden platforms that were suspended over the room below - graphically, all you would see is blackness corresponding to the pit even though you could safely drop down. 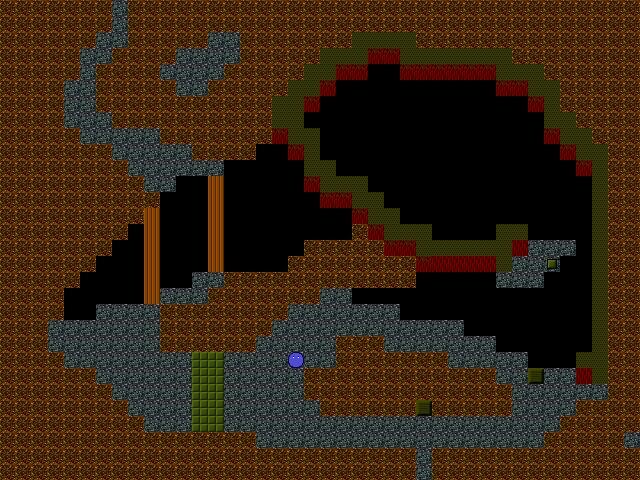 Well, I decided that I would up the ante by allowing the player to see the map underneath, as you can see in the image to the left. The current map (25, upper alcove of Cereal Forest) is the foreground with wooden platforms and the skilift; the map below (24, the forest maze) is visible as well. I still need to add a graphical offset so that the active map is brighter than the maps beneath as well as making the map fall points a little more obvious. On secondhand, I may not have to do that because hole dropping in Quadrill was never intended to be a calibrated method to land on specific tiles. [4-14-2013]_ Reconstruction of the original Quadrill is underway. With the amount of work I've got done so far, it's looking pretty nice. There's still a couple of unfortunate graphical glitches here and there that I need to figure out, as well as the basic functionality of the original Quadrill in concert with the newer methods that I've learned from the Quadrill 5 project. Also, Quadrill 5 is on extended hiatus for storyboard enhancement and revamping the original Quadrill series for .NET with DirectX 9. Let's be honest: everyone isn't running Windows XP with DirectX 7, so I have to bring my product forward with the audience, even if it costs me development time for the newer games (it will pay off because I can still make maps for Quadrill 5 and develop a storyline). [8-13-2004]_ Here is a picture of the Sauraqia cave from Quadrill, three years ago. Notice the piece of ground tile to the far right which is almost begging to be elaborated on in the future. Or maybe I just forgot to fill that one in during the map edition process. [4-1-2004]_I am thinking about redoing the graphics for Quadrill 1 and adding Save files so that the game is more enjoyable. [5-26-2003]_Yes, this game is finished (I am sooo excited, because I haven't technically finished any of the games besides Blocks). I finished it on July 23rd, 2002.... Looking back on this one, I can see how far I've come... but this is even still fun to play. He he he.